Help C0rk Succeed In School!!! 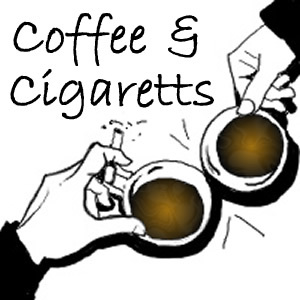 I am currently producing a podcast called Coffee & Cigarettes which has just recently become the focus of a class project about podasting. A major portion of this project will require my group to talk about the kind of feedback we received from individuals who consume what we create. That being the case, it is my hope that anyone reading this will subscribe to the podcast and drop me an e-mail with any kind of feedback you have. Let me emphasize that ANY feedback is valuable to our project, and the sooner you can supply it, the better, as our final presentation is due in two weeks. Below are some links which you can use to help out, and a detailed description of how to subscribe is provided on the website. Thank you in advance for any assistance you can render – a special treat will be in order. I don’t know how many of you are familiar with active camouflage, but it is a technology in development that is aimed at allowing individuals (presumably military) to disappear into their surroundings. The idea is actually quite simple. By projecting what is behind someone onto a canvas in front of them, the individual appears semi-transparent. Having seen some video of active camouflage prototypes, I can tell you that while it has a way to go, it’s very exciting. The effect is similar to that of the Predator in the movies of the same name – a suit/mechanism that allows in individual to blend into their surroundings on a level far superior to standard camouflage. Needless to say – I want one. It’s no secret that the iPod is the king of the digital media player market, but there is now a surge of players coming out using the rapidly increasing capacity of flash memory. Personally, I think the iPod shuffle, and other flash players like the Nomad MuVo that double as a USB jump drives are not only nice in terms of portability, but easy to use as an MP3 player or storage unit. Recently, while discussing this with friends, one ridiculed the Shuffle saying that no one could sell a player that lacked a display. I happen to disagree with his assertion. Having experimented with a number of players of this design, both with and without displays, I have to say that the displays are fairly useless in terms of navigating the content of the device. About the only thing the display is good for is identifying the currently playing song. That being the case, why spend extra money for a device with a display. I will, however, concede that players with displays can be purchased at a lower price than the Shuffle. I would not agree that Apple messed up with the shuffle by leaving out the screen. Admittedly, despite owning a 40GB iPod, I find myself wanting a Shuffle (in addition to my regular iPod), purely for situations that demand ultimate portability – working out, etc. The random track selection feature of the shuffle is also something that will force me to listen to music in my library that would otherwise go untouched. Even with 8,500+ songs, you’d be surprised how repetitive things can get when you’re not really dedicated to building play lists.